The women’s prison-based comedy drama will finish after its upcoming seventh and final series. It first aired in 2013 and has been hugely successful, picking up Emmys and Screen Actors Guild awards. The show is set in the fictional Litchfield prison and is based on the 2010 memoir Orange Is The New Black: My Year In A Women’s Prison by Piper Kerman. It quickly became a huge hit for Netflix and is one of its biggest ever original series. Uzo Aduba who plays Suzanne “Crazy Eyes” Warren said: “Season seven, you will not be disappointed. 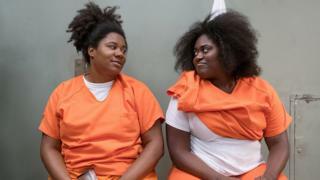 The show has been praised for its portrayal of prisoners, as well as tackling issues like gender, race and sexuality. The decision to bring it to a close comes as the popularity of Netflix continues to rise. It added seven million new customers in the three months to September, bringing its global total to more than 137 million. Another of its successful original shows, House of Cards, will also end after a final season which launches in November. Orange Is The New Black’s final episodes are expected to air in the summer of 2019.